When people ask if they homeschool in the summer, they say yes. When people ask when they have a break from learning, they say never. This has gone on for a long time now. July 24 is Learn Nothing Day — a vacation for unschoolers. As unschoolers, we tried our best to take advantage of our vacation day from learning, but alas, we failed. We’ve only been up for a couple of hours and already we’ve learned things! I learned a new exercise as part of the Daily Hiit and that the kids prefer their bagels untoasted. Ava learned how to spell several words, the color of her friends’ eyes and their Zodiac signs (she’s creating some of her friends in the Sims game). Julian claims he hasn’t learned anything, but I am skeptical. He’s watched a few gaming videos on YouTube, played with the chickens, collected eggs and then dried off some toys in a centrifuge (salad spinner). Both kids also proceeded to ask questions about why it’s Learn Nothing Day. Those darn kids and their questions. How do they expect to NOT learn if they are always asking questions! It’s only 12:41 p.m. so we still have the whole rest of the day to try to avoid learning, but we are meeting friends at the pool this afternoon. Is it possible to avoid all learning while swimming and being with your friends? We’ll do our best, but this is going to be a challenge! If you want to learn more about unschooling, you can check out my post What is Unschooling?. Just whatever you do, don’t read it today. 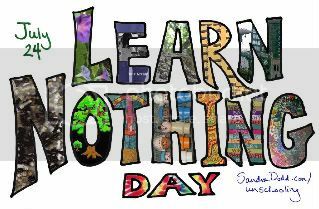 I wouldn’t want you learning something on Learn Nothing Day.